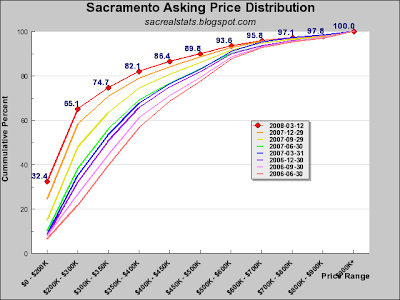 Lower-priced listings are becoming dominant in Sacramento County, with nearly 75% of all listings asking $350,000 or less. This is a rough cut of the graph; I will add a cleaner version with the other three counties when I do the weekly stats. What a beautiful sight to behold. Nice job Max. Its purdy, but as I mentiond @ ABs site, you now have a new supplier of homes in the low end....lenders. As long as you like them "any color you want" as long as you like the lawn dead, light less, unkept, etc. Most of the large builders, Fortune 500 corporations, constantly examine the trade offs between factory built homes vs site built. Most tract home builders today are really just assembling components on site, and more and more parts are being pre assembled. Has anybody noticed trucks of walls? I love kit homes but what is our there is far from affordable. I do love the concept and style. The affordable housing programs in Davis disgust me beyond belief, about as much as UCD's housing programs. I keep waiting for Davis to get something right. City fees to build? Oh don't get me started... but at least other cities in Yolo allowed people to build. Their budget problems are a fractions of Davis'. Nice. It pretty clearly shows the bifurcation in the market at about $500K (not much change above this point, but lots of change below it). There was a good discussion this week on the LALand blog about whether the bubble will deflate at the upper end, and in better neighborhoods. So $350,000 or less. Using a maximum of 4 times the salary, the "average buyer" needs $87,500 per year to make this happen. That seems closer to reality than in 2005, particularly if it is a two income household. Getting closer to an affordable level. How about an overlay graph with the right hand axis showing number of units closed at those prices, for those dates? Housing Subsidy Riot: Sign of Things to Come?